A mix of musicians will present a concert in honor of Fredericksburg-born composer Frank Valentin van der Stucken, on Friday, March 22, at 7:30 p.m. at St. Joseph’s Halle in Fredericksburg. This is the 22nd Festival, and celebrates Van der Stucken’s 155th birthday. Admission is by donation. Carol Wills, Mezzo-Soprano, will sing “Via de la Rosa,” by Billy Sprague and Niles Borop, accompanied by Mark Hierholzer. The Finale will be all participants singing the introduction to Van der Stucken’s Pax Triumphans (Triumph of Peace), which Van der Stucken traditionally used to end his concerts. Dr. Wolz is an authority on the German composer’s life, and will be available to answer questions during the reception following the program. 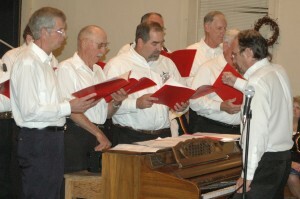 Van der Stucken, who was born in Fredericksburg in 1858, led the “Sangerbund” movement, training singers in the tradition of German male choruses. He also was a champion of contemporary American composers, conducting the first concert devoted exclusively to them. For information, call (806) 549-2483.